Incredible opportunity to take advantage of this Canyon Ridge multi family lot at a substantially reduced price! A building scheme is in place to ensure the quality and aesthetic value of your investment is maintained. 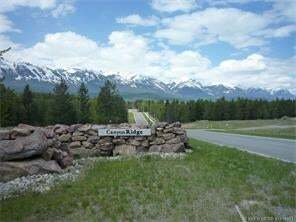 The property offers stunning views of the Rocky Mountains as well as Kicking Horse Mountain Ski Resort. This large, level lot has 286 ft of frontage with a depth of 201 ft. Take advantage of this potentially lucrative opportunity in Canyon Ridge.